“Dusk Light” Earrings. $350. SOLD. Sunset here is as red as the willows, dusk light as translucent as flame. In the second of his newest entries in his signature series of earrings that honor the light, Wings summons the scarlet glow of the late-day sky in this traditionally-designed pair accented with twilight fire. Each drop is a perfectly circle domed from beneath, repoussé-fashion, t0 create a softly rounded concha. Across the front, an eight-pointed star extends to cardinal and ordinal points by way of hand-stamped spokes fanning outward around the center. Each spoke ends in a hoop whose task it is to link the lodge pattern, radiant with the literal and metaphorical light, that lies between each tiny circle. At the center of the starburst, in a sawtoothed bezel, sits a single round cabochon of intensely red garnet, the scarlet shade of the not-quite-night sky. Conchas are polished to a brilliant mirror finish; tiny silver jump rings attach the earrings securely to sterling silver wires. 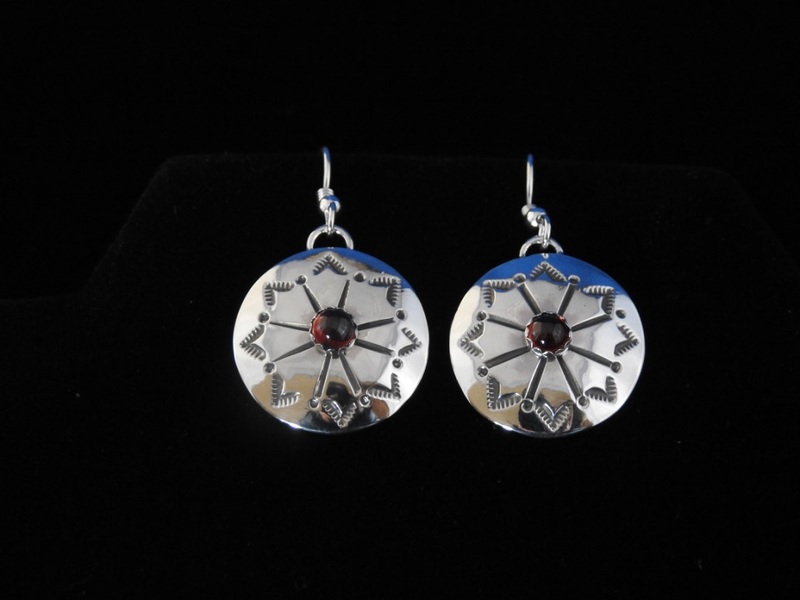 Earrings are 7/8″ across (excluding jump rings and wires); cabochons are 3/16″ across (dimensions approximate). Posted on Wednesday, December 26th, 2018 at 7:25 am. Filed under: Earrings	RSS 2.0 feed.